Published: Dec. 15, 2018 at 09:06 p.m.
Houston Texans wide receiver DeAndre Hopkins makes incredible TD grab to answer New York Jets. 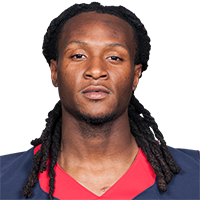 Houston Texans quarterback Deshaun Watson launches touchdown pass to wide receiver DeAndre Hopkins over every defender. Published: Dec. 9, 2018 at 04:14 p.m.
Houston Texans quarterback Deshaun Watson finds wide receiver DeAndre Hopkins open in the back of the end zone for a 7-yard touchdown pass.